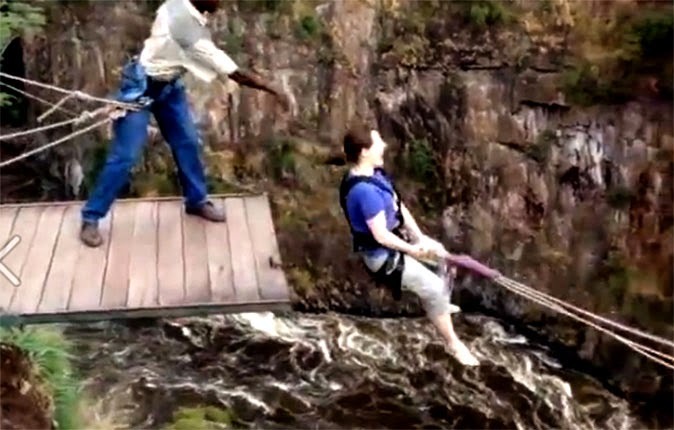 This viral video shows a woman being thrown off a cliff to a river with nasty current. Please don't watch this if you have a weak heart, you might die. The video, which was posted by Nova100 on Facebook, has drawn mixed reactions from netizens all around the world, many of whom said the adventure wasn't fun but crazy. "I wonder how many people died before they got the rope the right length," a certain Zachary Howell commented. "I'm gonna sleep in an effort to erase this video from my memory," said Karen Thomas, who is apparently afraid of heights. Krystal Courtenae, whose comment received over a thousand likes, said she "died while watching this." Then April Scott replied: "I'm pretty sure I'd have a heart attack before I made it to the bottom!" A curious Carla Jean Messer asked: "How did she get back up?" If you were in the shoe of the woman who was thrown off the cliff and into the river, what would you feel?